Our story opens with an undercover cop on the verge of being beheaded by a man in what appears to be the suit of sorrows. After the cop tries to convince him not to kill him since he was undercover he beheads him anyway. Next day members of the brotherhood of purity a splinter group of the order of Dumas read the papers and lament that the killer is lost to them. In a church confessional Michael Washington lane (MWL for short) confessed to kill the batman. The order meets to discuss MWL and how his unique background as one of three made ‘batmen” and the only survivor. His lack of family or friends also makes him a worth while candidate (Wife and child dead, also his siblings). MWL is at his family’s graves when a woman approaches him lamenting that she misses him as do his Niece and Nephew, he walks away from her without answering. The league of assassins are called before Talia al Ghul and told to retrieve the suit of sorrows and kill the man who stole it from the batcave. In the batcave Nightwing and Oracle discuss what’s happening in Gotham and the supposed return of Azrael. MWL is in a bar when the Batman RIP sign hits the Gotham skies. A member of the order approaches him as the next in line for the batman mantle. He carries him back to the church in which he had confessed and here learns the history of the order and is offered the suit of sorrows. He accepts but he wants them to remove the bat symbol. Outside the League of Assassins attacks, some of the order members are injured and he dons the suit outs the lights and takes the fight to them. Just as he has the upper hand Talia runs him through with the sword of salvation. Art- courtesy of Frazer Irving hits all the right notes, a dark and foreboding style which is too bright to be noir yet dark enough to be gritty. Cover- A very dynamic shot of our new Azrael in the “suit of sorrows”, easily a poster worthy shot. 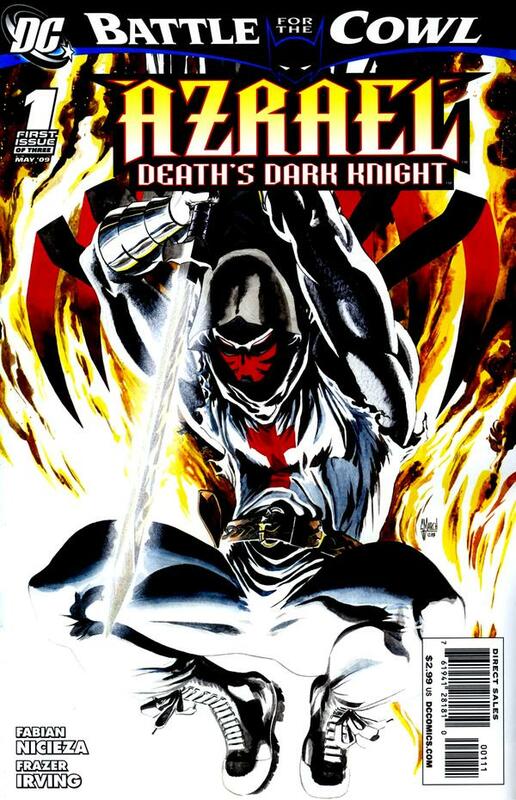 Accessibility- This issue gave enough back story on MWL for new readers to understand his mental state and ties to Batman that would warrant him taking over the role of Azrael. Canon- This story also fits nicely into the time frame of “battle for the cowl” in which Batman was dead and Gotham descended into madness. 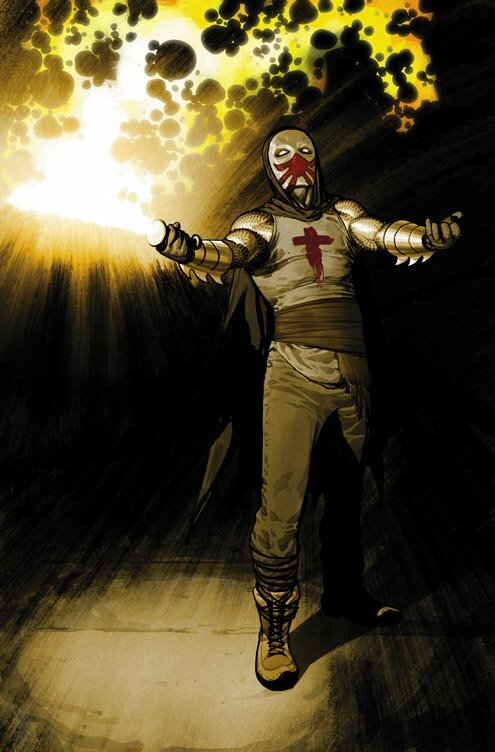 Story- great opening issue by Fabian Nicieza -I was intrigued by the new Azrael for a number of reasons….well for one he was the antichrist in the future and since most who wear the suit of sorrows eventually go insane….this may be the straw that broke the camels back. Another thing was because he was the first black batman I ever saw. His personality seems very different than he was portrayed back in the Batman series by Grant Morrison…there he was psychotic.. .or at least unhinged while here he seems so restrained. Only time will tell how messed up his mind is or will become by being “Azrael”. I also liked Talia and the league being used as adversaries since she was the one who brought the suit of sorrows to Batman in the first place. Also of note was the Azrael who killed the cop is different from MWL so that is a future conflict already in the making.